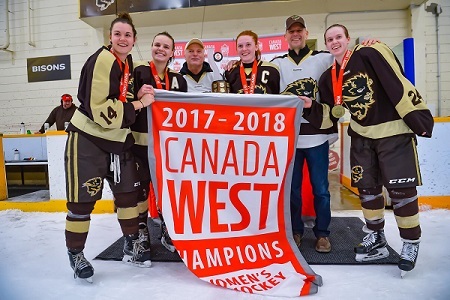 The Cana­da West Cham­pi­on Bison Women’s hock­ey team are in Lon­don, Ontario to play in the Nation­al Cham­pi­onship series. The quar­ter-final match up against Queens is TODAY! Puck drop is 3:00 PM CT and our own Trevor Phillips and Trevor Alexan­der are at the Uni­ver­si­ty of West­ern Ontario rink to call all the excit­ing action live and the pre-game show starts at 2:30 PM CT on 101.5 and online. HEAR THE HERD. CHEER THE HERD!! Only on the home of Bison Sports, 101.5 UMFM.